Finally, our first gift guide this year is live! We filmed this before we went away but I didn't get a chance to edit it until this week, so apologies the delay but hopefully it was worth the wait! 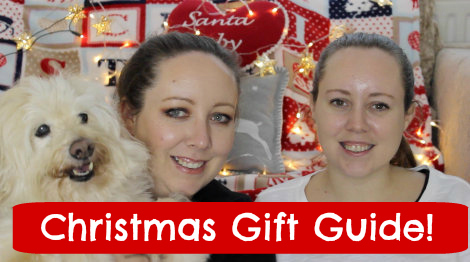 We've been stockpiling the best products that have landed at Lovely Girlie Towers over the past few months to bring you our 2014 beauty gift guide and of course, Bailey the brat makes an appearance! So grab a cuppa tea, sit back, snuggle up and start preparing to want all the things for yourself! Did you see anything that tickled your pickle? Luckily most of our Christmas shopping is done but we've some last minute bits and pieces to get over the next couple of weeks. Not long to go now! Cool ~ I picked up some good ideas here! Great video thanks! Got loads of ideas for presents and for myself too. Can I ask Joanne what polish she's wearing in the video?